Charging ahead with the dramatic remaking of his White House, President Donald Trump said Thursday he would replace national security adviser H.R. McMaster with the former U.N. Ambassador John Bolton, a foreign policy hawk entering a White House facing key decisions on Iran and North Korea. After weeks of speculation about McMaster's future, Trump and the respected three-star general put a positive face on the departure, making no reference to the growing public friction between them. Trump tweeted Thursday that McMaster had done "an outstanding job & will always remain my friend." He said Bolton will take over April 9 as his third national security adviser in just over a year. 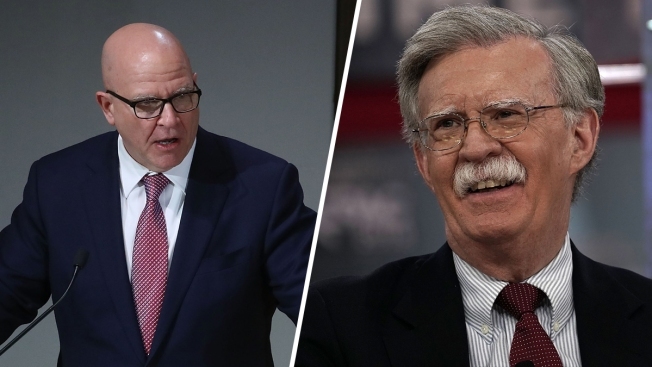 The national security shakeup comes as the president is increasingly shedding advisers who once eased the Republican establishment's concerns about the foreign policy and political novice in the White House. McMaster is the sixth close adviser or aide to announce a departure in a turbulent six weeks, joining ally Secretary of State Rex Tillerson, who was unceremoniously fired last week. Before leaving for a presidential tour of Asia, National Security Adviser H.R. 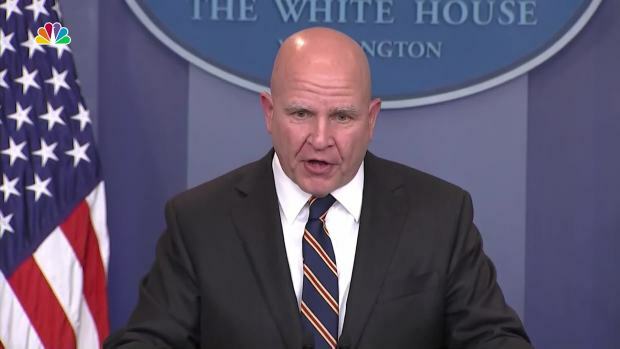 McMaster responded to criticism of President Trump's tweets about North Korea. The White House said Thursday that McMaster's exit had been under discussion for some time and stressed it was not due to any one incident, including this week's stunning leak about Trump's recent phone call with Russian President Vladimir Putin. Chief of Staff John Kelly and Defense Secretary Jim Mattis had been pushing Trump to get rid of McMaster and had been escalating their campaign in recent weeks. It had appeared McMaster's departure was imminent last week — but White House officials insisted the speculation was false. President Donald Trump announces Army Lt. Gen. H.R. 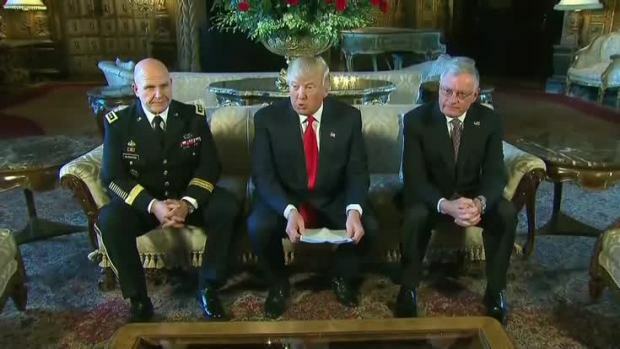 McMaster as his pick for national security adviser at Trump's Mar-a-Lago estate in Palm Beach, Fla., Feb. 20, 2017. "Just spoke to @POTUS and Gen. H.R. McMaster — contrary to reports they have a good working relationship and there are no changes at the NSC," White House press secretary Sarah Huckabee Sanders tweeted late last Thursday night. A strong supporter of the Iraq war and an advocate for aggressive use of American power, Bolton was unable to win Senate confirmation after his nomination to the U.N. post alienated many Democrats and even some Republicans. He resigned after serving 17 months as a Bush "recess appointment," which allowed him to hold the job on a temporary basis without Senate confirmation. Tension between Trump and McMaster had grown increasingly public. Last month, Trump took issue with McMaster's characterization of Russian meddling in the 2016 election after the national security adviser told the Munich Security Summit that interference was beyond dispute. "General McMaster forgot to say that the results of the 2016 election were not impacted or changed by the Russians and that the only Collusion was between Russia and Crooked H, the DNC and the Dems," Trump tweeted Feb. 17, alluding to frequent GOP allegations of impropriety by Democrats and Hillary Clinton. Tillerson's exit also forecast trouble for McMaster, who had aligned himself with the embattled secretary of state in seeking to soften some of Trump's most dramatic foreign policy impulses. McMaster told The New York Times last year that Trump's unorthodox approach "has moved a lot of us out of our comfort zone, me included." McMaster was brought in after Trump's first national security adviser, Michael Flynn, was dismissed after less than a month in office. White House officials said he was ousted because he did not tell top advisers, including Vice President Mike Pence, about the full extent of his contacts with Russian officials.